While the interface of the Android web browser has hardly changed, the hardware specs of the Samsung Galaxy S II Skyrocket propel it to great heights of user experience. The large, sharp display with great colors makes reading a joy. The browser supports both double tap and pinch zooming along with the new two-finger tilt zoom. There are niceties such as multiple tabs, text reflow, find on page and so on. A neat trick is to pinch zoom out beyond the minimum – that opens up the tabs view. Hubs are not just for Windows Phone – Samsung, at least, seems to think so. They’ve added two Hubs to their Android powerhouse. The Skyrocket comes with Quickoffice preinstalled. It’s one of the most feature rich mobile editors we’ve seen. You can view and edit Word, Excel and PowerPoint documents and there’s a PDF viewer too. The smartphone features a decent alarm clock application which allows a huge number of alarms to be set, each with its own start time and repeat pattern. There’s a YouTube app although it’s really irrelevant here. It cannot match the resolution the in-browser flash player can give you. 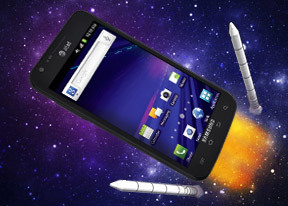 With a 1.5GHz dual-core CPU and powerful new graphics, the Galaxy S II Skyrocket can run every Android app designed for phones. The OS version is 2.3.5 so you won’t have any problems on that account either. The Samsung Galaxy S II Skyrocket comes with Kies Air preloaded. The app connects to the local Wi-Fi network (or it can create a Wi-Fi hotspot) and gives you a URL to type into your computer’s web browser.